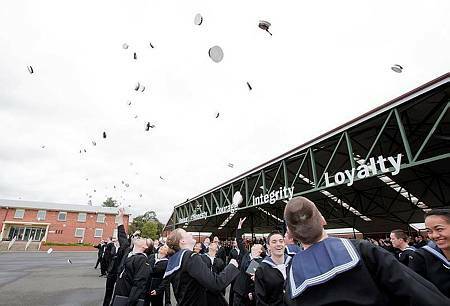 For the first time in the history of the Royal Australian Navy’s Recruit School, a recruit division named after a sailor, rather than an officer, graduated today. Eighty recruits were welcomed into the Navy from Shipp Division, named after the late Leading Seaman Noel Ervin Shipp, during a Graduation Parade for General Entry class 314 that was held at HMAS Cerberus. Shipp joined the Royal Australian Navy on January 10, 1963, as an underwater control rating. He then transferred to the aircrewman category in July 1967, and the following year was posted to the RAN Helicopter Flight Vietnam (RANHFV). Leading Seaman Shipp is remembered for determinedly engaging the enemy under heavy fire, while hanging out the door of his aircraft, with his M60 machine gun. Exposed to heavy automatic fire, the helicopter crash landed and Leading Seaman Shipp was seen to continue firing at the enemy right until the moment of impact. The Reviewing Officer for today’s Graduation Parade was the Commander of the Australian Fleet, Rear Admiral Tim Barrett, AM, CSC, RAN. He said that Shipp had set a fine example for today’s graduates to follow throughout their Navy careers. “Shipp’s courage and commitment was of the highest order and his story will serve as a constant reminder to these graduates of the values expected of them by the Royal Australian Navy, the Australian Government and the Australian people. “I was particularly proud to review the first graduates of Shipp Division, and have challenged all of them to serve out their Navy careers in such a way that honors the late Leading Seaman Noel Ervin Shipp,” Rear Admiral Barrett said. Shipp Division is one of four Recruit School divisions to be renamed this year to better recognize the distinguished service of sailors throughout the history of the Royal Australian Navy.